More than 100 all-terrain armoured vehicles destined for use by soldiers in Afghanistan are to be equipped at a new base near Llanelli. Thales UK is employing around 30 people at its centre at the former Ministry of Defence (MoD) depot at Llangennech. They will equip the Warthog vehicles worth over £150m with communications systems, specialist counter-measure equipment and extra protective armour. The vehicles are due to enter service in Afghanistan next year. Thales UK has invested more than £1.5m in its new facility at what is now called the Stradey Park Business Centre. 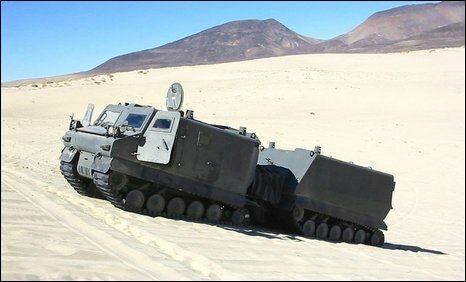 It said the contract to fit the Warthog to MoD specifications was worth £20m. 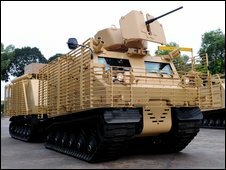 They will be deployed in Afghanistan as part of the new package of protected patrol vehicles first announced by the MoD last year. Thales said it hoped its new facility would subsequently be used to deliver other contracts. First Minister Rhodri Morgan is due to visit the site later as the investment has been supported by the Welsh Assembly Government and Carmarthenshire council. He said: "Investments in technology, people and new industrial facilities from innovative companies like Thales UK are key to the future prosperity of Wales. "We wish Thales every success here and look forward to seeing their business develop further in west Wales and, indeed, elsewhere in Wales. Alex Dorrian, CEO of Thales UK, said: "Today's opening marks a significant step in our ongoing investment programme in support of the development of our UK land systems business, following the opening of new sites in Bristol last year and Crawley last week. "The opening of Thales's west Wales site will initially create around 30 new skilled roles to help deliver the MoD's Warthog capability. "Thales is looking into a number of other opportunities in the defence and wider government sectors that may ultimately result in work for Thales in west Wales." The Warthog is described as a highly agile vehicle that can manoeuvre across difficult terrain, roll across trenches, tackle vertical obstacles, power-up steep gradients and even cling to slopes. More than 100 have been bought by the UK government in response to an urgent operational requirement. They will come in four variants: troop carrier, ambulance, command, and repair & recovery. The former MoD depot at Llangennech closed with the loss of 190 jobs last year. The 37-acre site has been turned into a business park with the aim of eventually creating up to 400 jobs.